As night descended on a memory-laden New York City on Sunday, September 11, 88 light cannons were powered up, shooting beams of light into the air representing the profiles of the original Twin Towers. We stopped by Saturday night, as crews were putting the finishing touches on the display and double checking that all the lights performed flawlessly, and the close-up result was nothing short of amazing. The Tribute in Light display is perched atop a parking garage adjacent the Brooklyn Battery Tunnel, standing close to One World Trade Center, which itself was wrapped in red, white, and blue lights for the commemoration. On the garage roof, two twin 48-foot square rings of light projected four miles into the partially cloudy Saturday night sky, creating an aura of tranquility that brought to mind sitting in a great cathedral or perhaps superman's lair. The only movement around the solid blue beacons were millions of circling insects drawn to the display's beams, occasionally flying too close to the hot lights and catching fire, leaving small trails of smoke wafting from the tops of the cannons. The twin beacons could be seen for miles around, up to 60 miles on a clear day, and we spotted them from several locations in Manhattan and Brooklyn. For the first time this year, Tribute in Light was powered entirely by biodiesel fuel, making the powerful light display not just a moving gesture but also a green one. Now the Municipal Arts Society who sponsors the annual light show is hoping to make it financially sustainable as well and has launched a fundraising campaign to establish an endowment. Donations can be made online or an instant $10 can be donated by texting TRIBUTE to 20222. Click on a thumbnail to launch the slideshow. 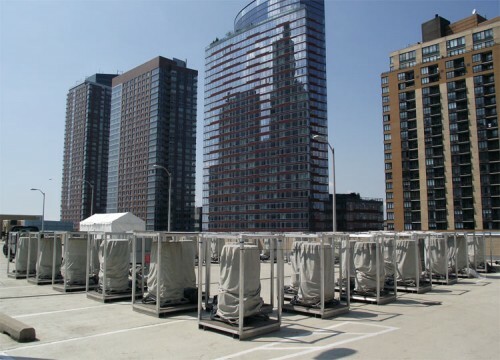 Perched on the rooftop of a parking garage in Lower Manhattan a few blocks from the World Trade Center site, two groups of 44 light cannons pointing skyward will soon project high-intensity beams of light into the night sky for Tribute in Light, marking the tenth anniversary of the 911 World Trade Center attacks. Last week, as a crew of 30 workers was positioning the lights and laying cable to a large generator on the sidewalk, we stopped by to learn more what's involved with the massive display. Presented every year by the Municipal Arts Society, the display will shoot skyward at dusk on Sunday, September 11 and run through the night. 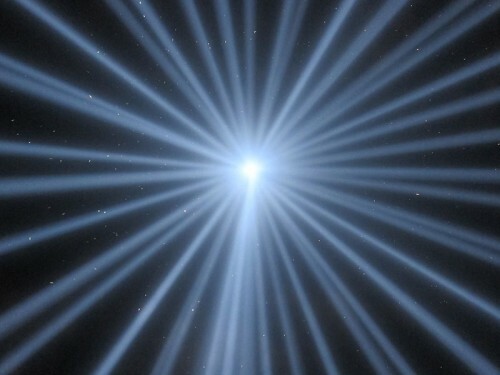 Tribute in Light was initially conceived by three independent groups of architects and designers who each had a similar idea at the same time. Lighting designer Paul Marantz helped the groups merge their ideas into one viable lighting display, finding common ground between the three designs. 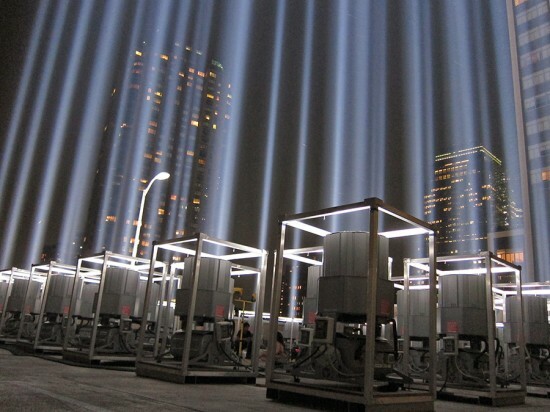 "Light cannons," spotlights about 18-inches in diameter supported in metal frames, are arranged in square rings representing the footprints of the Twin Towers and staggered for optimum light density. Michael Ahern who is producing the display said the staggered pattern gives depth to the 48 foot by 48 foot squares. Once powered up, each of the 7,000-watt xenon searchlights will merge to form a beam of light that shoots four miles into the sky and is visible for 60 miles around. Ahern said such high-intensity lighting displays are rare, but noted that iconic beam shooting from the top of The Luxor casino in Las Vegas also projects light skyward in a similar fashion. Before the lights can be turned on, technicians must align each cannon so the entire array points in exactly the same direction to avoid the scattering of light. Spotters are dispatched to New Jersey, Staten Island, Brooklyn, and Uptown Manhattan to make sure the lights come together as a single beam. This labor-intensive process can take up to eight days. Once the switch is flipped, the display takes about five minutes to reach full intensity. Ahern said standing on the roof watching the lights is "beyond awesome...looking up , it really is genuinely amazing." He compared the experience to standing in a cathedral of light. The beams emit a slight blue hue, the same color as daylight, according to Ahern. With this many lights drawing so much electricity, Tribute in Light is not cheap. Combined with a grant from the Lower Manhattan Development Corporation, the Municipal Arts Society has funded the $500,000 show out of its operating budget, but now that the grant money has run out, funding for future years is in jeopardy. The MAS is now seeking to establish an endowment and to find a permanent location to keep the lights running for years to come. The group has launched a fundraising campaign with a goal of several million dollars. Donations can be made directly to MAS at their web site or by calling 212.935.2075 or an immediate $10 donation can be made by texting the word TRIBUTE to 20222.